To say that this is one of the most rewarding countries you’ll ever visit is not an exaggeration. First of all, there are several-thousand years of history buried (and not so buried) here. There’s the elaborate mosques, teahouses hazed with shisha smoke, markets crammed with spices and goat heads (not for everyone) and a culture so diverse it made me wince for my ignorance of it all. And kebabs. Real, juicy, out-of-this-world kebabs. 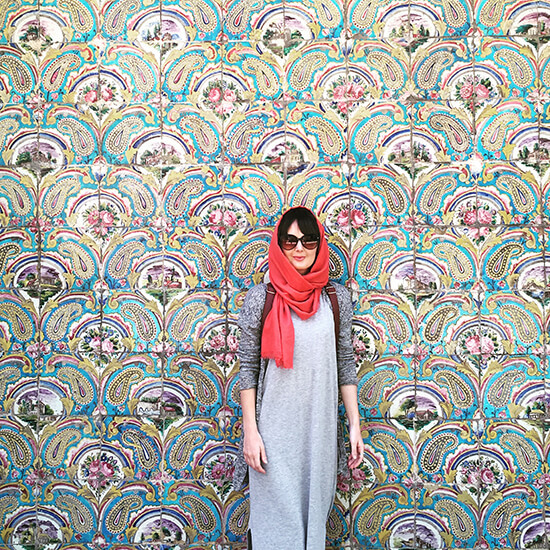 Busted: Iran is one of the safest countries to visit in the Middle East. Warnings are in place against travelling within a certain distance of the Iran/Iraq border, the Afghanistan/Iran border, and the province of Sistan-Baluchistan (including the border with Pakistan). But the bulk of the country is incredibly safe, and you shouldn’t run into any hassle as long as you respect local laws. Busted: Officially, yes. 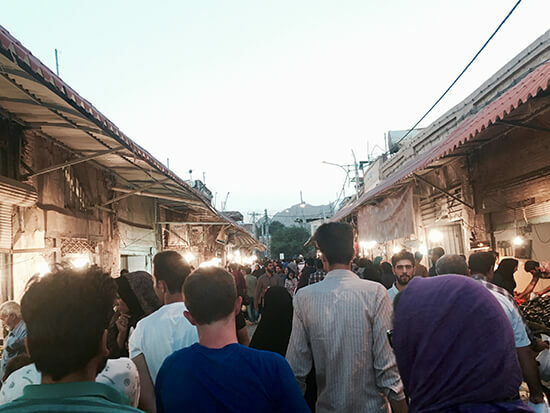 Iran’s Islamic Republic is a repressive regime that enforces strict Islamic law on citizens and visitors alike. But the people here are way more liberal than you think. Almost 60% of the population is now under 35 years old, many frustrated with the country’s theocratic rule. They are well-educated (both men and women) and they’re ready to welcome the world to their country and to show it for what it really is, not what those in power want it to be. Busted: Political tensions with the West may still be palpable, but the majority of Iranians will only be pleased to see you. Their welcome is legendary. It might be a group of friends inviting you to their home for dinner, a woman on the bus telling you what a beautiful nose you have (thank you) or even children in a mosque showing you how to pray with a turbah. It’ll knock you sideways — in a great way. Busted: Not at all. Only the most devout muslims wear a burka here. Most just wear a hijab. And even then, in the big cities you’ll see women pushing the boundaries by wearing their headscarfs loosely, some barely covering their heads at all. You’ll need to wear fairly loose clothing, keeping your limbs, bum and chest covered. Bring light-coloured clothes in summer. More on this later. Busted: Yes it’s a dry country, and alcohol is prohibited. But who doesn’t love a detox these days? Swap the booze for the shisha pipe (fine, technically not a detox) and head for the teahouses for a smoke and some sweet tea. Great food, great music and great people — and absolutely no hangover. You’ll probably start in the capital, where the Azadi Tower stands as one of Iran’s most recognisable icons. For a a little more glam, head to the Jewellery Museum to find the world’s largest pink diamond. The Golestan Palace is one of the city’s oldest monuments, covered in colourful tiles and home to a fantastic archive of Iranian photography — a legacy left by the Qajar king (and former resident) Nassereddin Shah. For a lively night of food and music, head to the Azari Teahouse. More of a base than a destination (though the town bazaar is well-worth a visit). 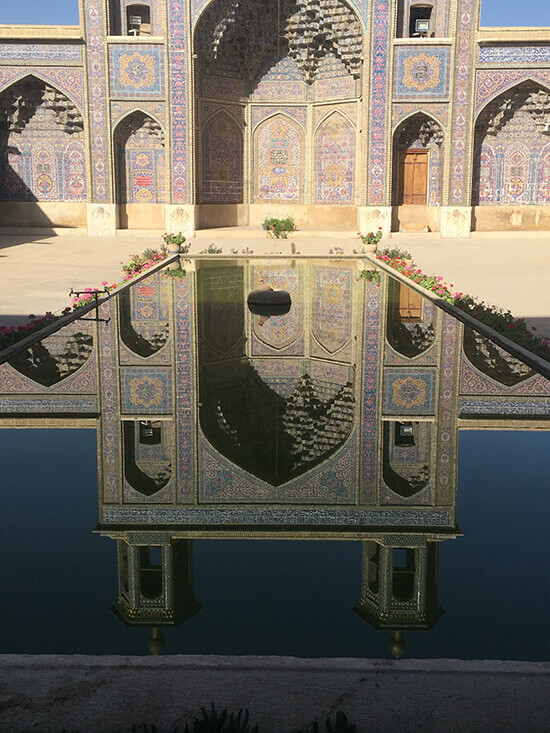 The Shazdeh Garden is a lush oasis in an otherwise dry and brutal desert, and the Rayen Citadel (62 miles south) dates back to medieval times and was an important centre on the Silk Road trade route. Call by the Friday Mosque (Jameh Mosque) to witness the call to prayer. The home of Zoroastrianism — one of the world’s oldest existing religions — and one of Iran’s most intriguing cities. Visit the Zoroastrian Tower of Silence on the outskirts, where they once brought the dead to be eaten by vultures so not to tarnish the earth, and visit the Zoroastrian Fire Temple. In the evening, call by the House of Strength to see men building and displaying their strength in a physical act of praise and prayer. Iran’s poetic muse, and burial place of the renowned poets Sa’di and Hafez. 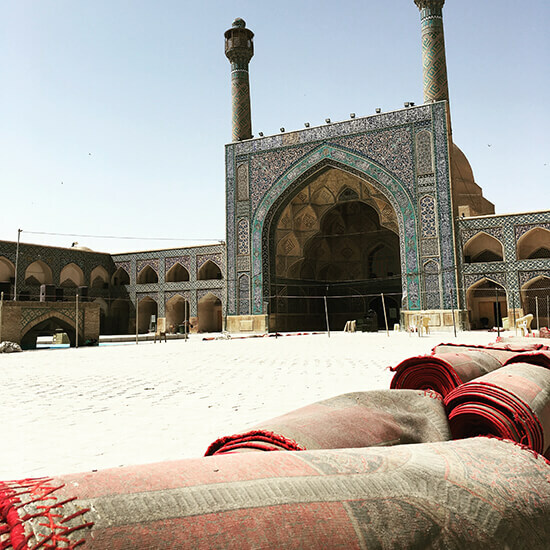 Visit their shrines, continue on to Nasir-ol-Molk (or Pink) Mosque (try catch it when the light is right) and the vast Shāh Chérāgh Mosque, a funerary monument and important pilgrimage site. An hour north you’ll find Persepolis, one of Iran’s most celebrated UNESCO sites, built by Darius the Great in 518BC. 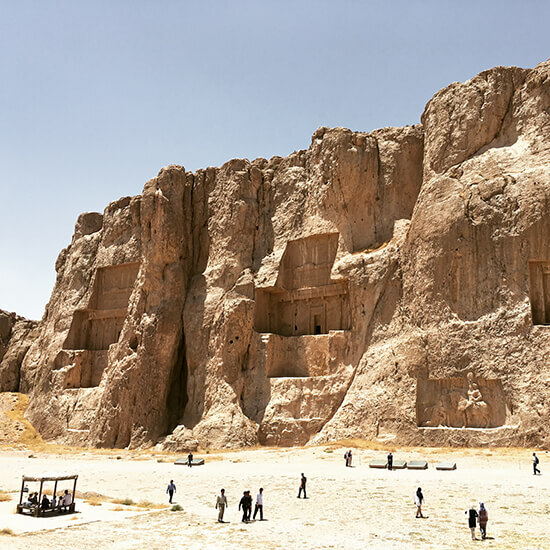 Down the road, the ancient necropolis of Naqsh-e-Rustam will take your breath away where four tombs belonging to Achaemenid kings are carved into the rock face. 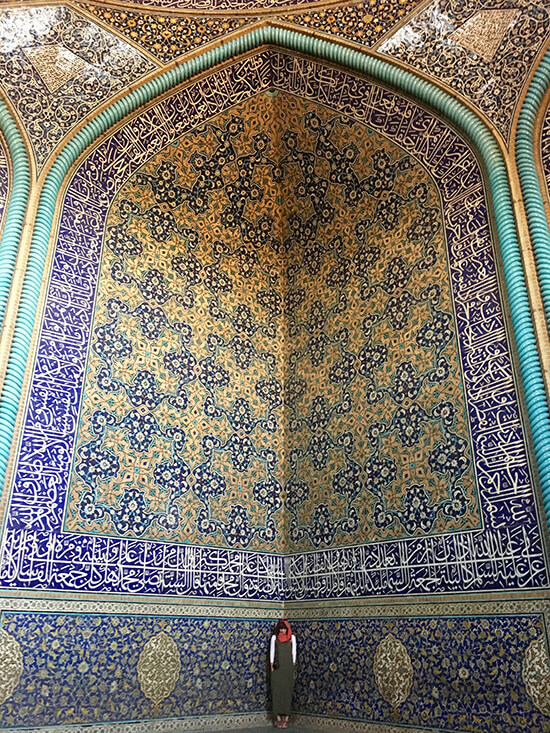 Without a doubt, Iran’s most beautiful (and most turquoise) city with no small thanks to UNESCO-listed Naqsh-e Jahan, or Imam Square. Surrounded by a colourful bazaar, there are also three big attractions. The first being Ālī Qāpū Palace — make a bee-line for the music room. The second is the Shah Mosque and the third (and my favourite), the Sheikh Lotfollah Mosque. Gorgeous mosaics aside, the star here is the roof — find the peacock! Most nationalities can get their visa on arrival. British, Canadian and US citizens need to secure one beforehand. In these cases, you’ll need to book an official tour first then wait for an invitation to apply for a tourist visa. Leave plenty of time for processing. Men and women should cover up at all times. Men usually are in trousers/jeans and shirts. Short sleeves are fine, but not shorts. Women should to be savvy, especially in the heat. Team up light long-sleeved tops with loose, sleeveless maxis, and pack a tunic/manteau to throw over light tops and trousers/jeans. Open sandals are fine. Let those babies breathe. Facebook, Twitter and Google Plus are all blocked, but Instagram is (oddly) allowed. Locals have a way of bypassing these restrictions, but it can also be a welcome break! Make an appointment with one of our Travel Experts to book your trip to Iran, or take a look at our G Adventures tours.